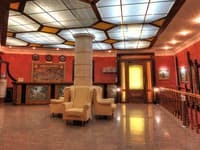 Hotel "Visak" is located in one of the quietest, cozy, fashionable districts of Kiev - Obolon. 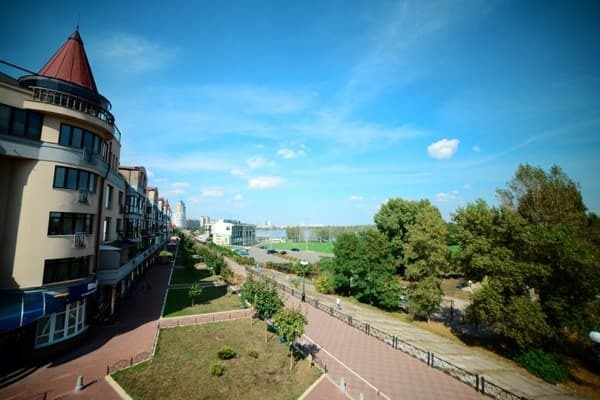 Well-groomed blossoming embankment of the Dnieper, far from the bustling city center, attracts both the citizens of Kiev and the guests of the city. 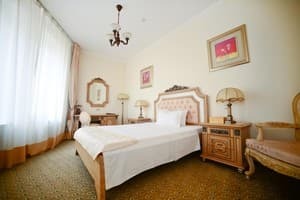 The interior of the hotel is made in the style of antiquity with the use of marble, granite and crystal; all rooms are equipped with furniture in a classic style. 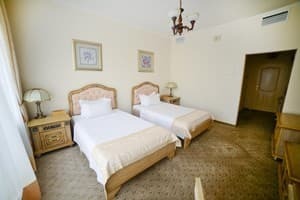 The hotel "Visak" 43 spacious rooms, equipped with comfortable furniture, individual air conditioning, refrigerator, mini-bar, international telephone, satellite TV, free access to wired and wireless Internet. The hotel offers a SPA-salon, which includes the Roman Baths, a Turkish sauna with a swimming pool, an infrared sauna, massage rooms, body and face care services. For business meetings and conferences, the hotel "Visak" offers an assembly hall with 160 seats, in which all conditions for negotiations and meetings are created. The room is equipped with ventilation and air conditioning. 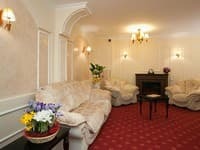 There is also a conference hall for up to 40 people and 2 VIP rooms for 14 and 8 people. In addition, there is an opportunity to order coffee breaks, lunches. It is interesting to spend time with colleagues or family guests can in the billiard room or in the Golf Club, which is located in front of the hotel. Delicious European and Ukrainian cuisine, as well as an extensive selection of drinks are always available in the restaurant "Aristocrat", which works around the clock. Description of the room: The rooms have a total area of ​​approximately 21 sq.m. Standard room has a bedroom and a bathroom. 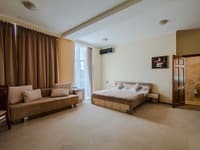 The room is equipped with one double bed, comfortable work desk with free wired and wireless Internet, plasma TV, telephone with international connection. In addition, all rooms are equipped with minibars, safes and individual air conditioning. Rooms in this category have access to the balcony. Description of the room: Bright rooms with a total area of ​​approximately 28 sq.m., consisting of a bedroom and a bathroom. The room is equipped with two single beds, a comfortable work desk with free wired and wireless Internet, telephone international communication. All rooms in this category have a balcony and a beautiful view of the park area. Maximum number of guests in a room is 2 persons. In the bathroom there is a shower and necessary accessories. Description of the room: Bright rooms with a total area of ​​approximately 28 sq.m., consisting of a bedroom and a bathroom. The room is equipped with one double bed, a coffee table and two armchairs, a comfortable work desk with free wired and wireless Internet, telephone international communication. These rooms have a balcony and a beautiful view of the park area. Maximum number of guests in the room is 3 persons (in the room there is an option to use an extra seat). In the bathroom there is a shower and necessary accessories. Description of the room: Two-room suite with a total area of ​​approximately 36 sq.m. The suite has a bedroom, a living room and a bathroom. The room is equipped with one double bed, comfortable desk with free wired and wireless Internet, coffee table, sofa and two armchairs, telephone international communication. 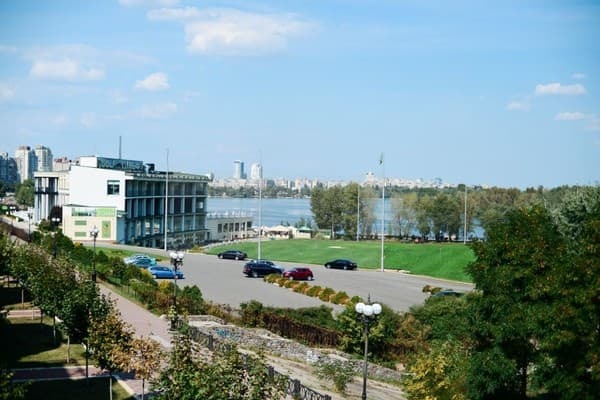 Rooms of this category have access to a balcony and a beautiful view of the park and the Dnieper. Maximum number of guests in the room is 3 persons (in the room there is a possibility to use an extra bed). In the bathroom there is a shower and necessary accessories. Children under 5 years stay free of charge. Children's beds and a children's table can also be provided for children. 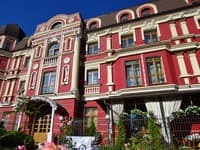 Extra bed is available for adults and children over 12 years at a cost of 500 UAH with breakfast. For children under 12 years, an extra seat is provided for 400 UAH. Breakfast (Swedish line) is included in the price. The hotel has a restaurant of European and Ukrainian cuisine "Aristocrat". The Obolon metro station is 2 km away. The distance to the railway station is 13 km (25 minutes by metro), bus station - 15 km (30 minutes by metro), Borispol airport - 40 km (40 minutes by car). 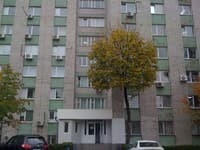 To the railway or bus station you can take the metro from the station "Obolon".